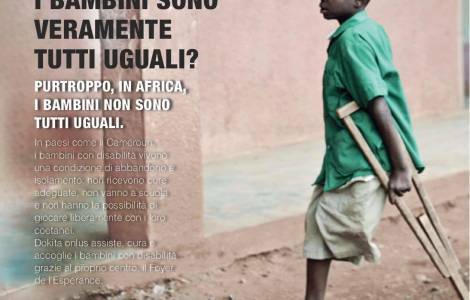 Sangmelima (Agenzia Fides) - Cameroon is one of the African countries with the highest incidence of disability in children. According to UNICEF estimates, 23% of people aged between 2 and 9 live with at least one type of mental and physical dysfunction, often arising from diseases such as malaria, leprosy, measles and malnutrition. More than 35 years ago, in the south of Cameroon, the humanitarian organization Dokita Onlus created several specialized centers. These include the Foyer de l'Esperance, in Sangmelima, where every year over 6000 children and young people with disabilities find medical care and rehabilitative therapy.